A coalition of 35 community groups advocating against racism is demanding organizers of a Toronto debate series cancel a November event featuring Steve Bannon, the controversial former chief strategist to U.S. President Donald Trump, in the wake of the Pittsburgh synagogue massacre. A coalition of 35 community groups advocating against racism is demanding organizers of a Toronto debate series scrap a November event featuring Steve Bannon, the controversial former chief strategist to U.S. President Donald Trump, in the wake of the Pittsburgh synagogue massacre. The coalition ramped up its call during a Tuesday morning news conference, saying having Bannon participate in the sold out Munk Debate gives him a platform to "normalize his hateful ideology" — however, the organizers are standing by the event. 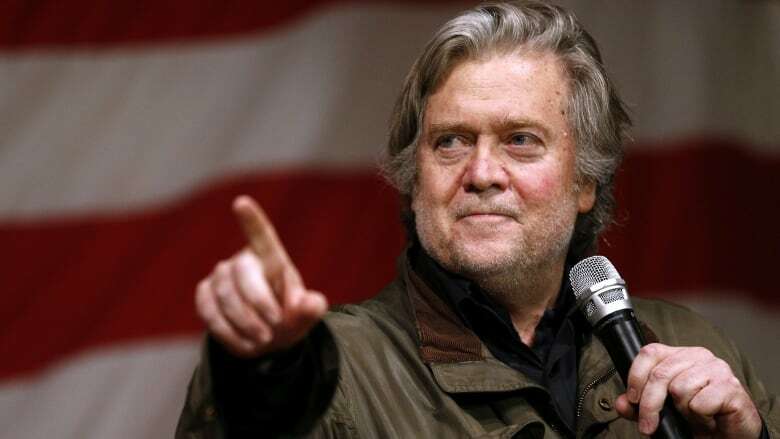 Dozens of students from the Munk School of Global Affairs and Public Policy, at the University of Toronto, have also signed an online petition against Bannon's appearance, arguing hateful rhetoric is being presented and defended under the guise of free speech. "Bannon is not just stopping by for a chat," said Maya Menezes, who is with the Toronto chapter of No One Is Illegal, a national advocacy group for immigrants and refugees. "This is part of his failing world tour to create a foundation called 'The Movement' aimed at supporting right-wing parties throughout the world." The group also urged ticket holders to "rethink" their support and to boycott the event. Menezes says the debate's organizers shouldn't be benefiting from handing over a stage to "dangerous white men propagating hateful white supremacy and violence." The semi-annual Munk debates — founded by the late Peter Munk and his wife, Melanie — tend to focus on polarizing topics and have been attended by a number of controversial guests since launching in 2008. She wasn't alone in condemning the debate. "The hate we are witnessing is serious. In fact, it is deadly," said Rachel Epstein, executive director of the United Jewish People's Order. Eleven people were killed last Saturday when a gunman walked into the Tree of Life synagogue during worship services and opened fire while expressing hatred of Jews. The deadly rampage rocked the Pittsburgh Jewish community and those abroad. "Opposing this kind of hate and the violence it fosters is not up for debate," Epstein said. The coalition also plans to rally outside Roy Thomson Hall, where the debate, called "The Rise of Populism," is set to take place on Nov. 2. 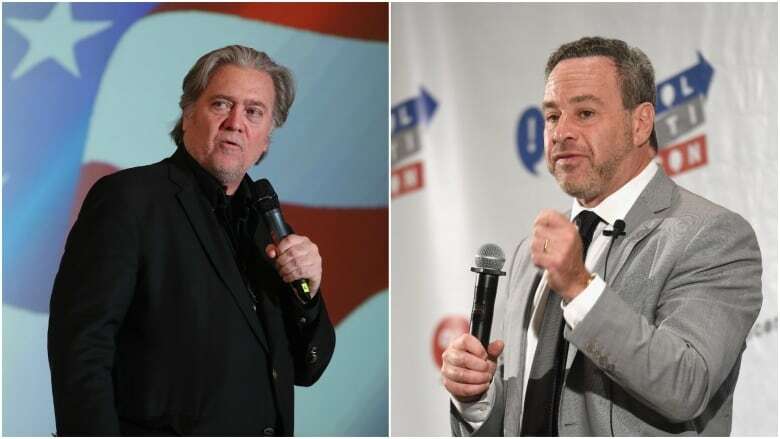 The chair of the Munk Debates defended the event Tuesday, issuing a statement saying he looks forward to bringing together the "sharply different views on populism" of Bannon and conservative commentator David Frum. Rudyard Griffiths said the event aims to offer a neutral public form to discuss controversial issues. "In this context, the rise of populist politics in western societies was an obvious topic to tackle at our upcoming debate," Griffiths said in a statement. "We believe we are providing a public service by allowing their ideas to be vigorously contested and letting the public draw their own conclusions from the debate." James Turk, the director of Ryerson University's Centre of Free Expression, says he doesn't agree with Bannon but isn't sure cancelling the debate is the right move. "We have populism sweeping the globe and we aren't able to analyze it and see what's wrong with it," he said. A debate, Turk said, may actually be the right format to challenge Bannon's ideology and the hateful statements he's made in the past. Banning Bannon from speaking, however, could actually boost his popularity among his followers. "Suppressing hateful speech or racist speech is not an effective way of bringing it to an end," Turk said. While the coalition says it supports debate of controversial topics, Nigel Barriffe, president of Urban Alliance for Race Relations, believes Bannon's participation "undermines democratic principles" because it encourages "white nationalist violence." "Providing him a high-profile Canadian platform contradicts the democratic freedoms we cherish," he told reporters. Critics have attacked Bannon, a former White House aide and ex-chairman of conservative news site, Breitbart News Network, for stoking racial divisions and advocating for far-right ideas. Bannon is expected to argue in favour of populism during the debate against Frum — a former speechwriter for George W. Bush, who served as president from 2001 to 2009. "I want to bring everything crashing down and destroy all of today's establishment," Bannon is quoted as saying on the website promoting the event. In September, The New Yorker magazine dropped its plan to have Bannon as a featured guest at its annual festival after facing sharp backlash from readers and celebrities. Within hours of making the announcement, New Yorker editor David Remnick cancelled the interview, saying he didn't want Bannon to "propel further the ideas of white nationalism, racism, anti-Semitism and illiberalism." Earlier this week, a federal NDP politician called on organizers of the Toronto debate series to cancel the event "out of respect for the victims in Pittsburgh." "It isn't acceptable to give provocateurs like Mr. Bannon the opportunity to present their extreme views," said MP Charlie Angus.